Today we're going to continue the sermon series that we started last Sunday, a series that will take us all the way through the month of January. 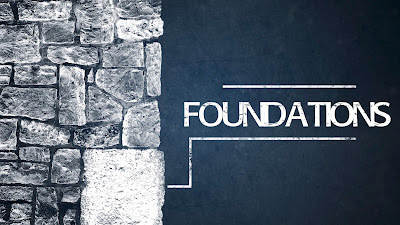 We've entitled this series "Foundations," and we're focusing on what it takes to build a strong foundation to have the best year you can possibly have in 2017. Last week we learned a valuable principle that we're going to come back to each week of this series--it's sort of our guiding principle and it's pretty simple. I have to give credit where credit is due on this, however. I didn't come up with it on my own--I learned this from pastor/author Andy Stanley's book The Principle of the Path. Here's what we learned that I want to re-share: It's your direction, not your intentions that determines your destination. In other words, you might have the best intentions in the world, but if the direction you are heading is not leading you where you claim that you want to go--you won't get there. 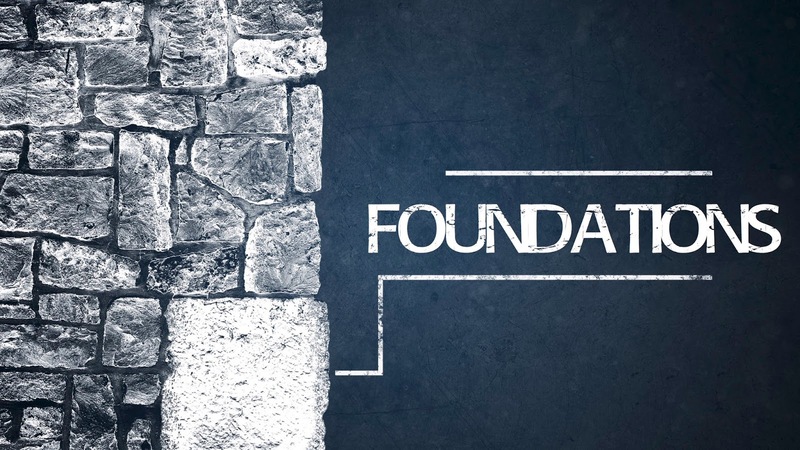 For our purposes, we determined that the best way to have that strong foundation for 2017 in order to take that first good step in the right direction is to discover some important building blocks, so to speak. Last week we talked about the building block of faith, and this week we're talking about trust. I learned a valuable lesson about trust when I visited Niagra Falls several years ago. There is a museum at Niagra Falls that relates all of the history of the many daredevils who attempted to do crazy things like go over the falls in a barrel or various kinds of crafts. There was even a story of a guy who got swept over and managed to survive without anything to help him float. But the stories that intrigued me the most were the ones about the tightrope walkers who walked tightropes across the falls, particularly Charles Blondin, who was one of the first to do so in the 19th century. Blondin was famous, and he could draw a crowd. People knew about his exploits and would come from far and wide when he was about to perform a stunt. He loved to ask the crowd "Do you believe that I can walk across this tightrope with a person on my back?" Most of the crowd would exclaim that they did, in fact, believe he could do it. "Are there any volunteers?" Blondin would ask. Silence. The only person who would ever take Blondin up on his offer was his manager, Harry Colcord. Colcord would climb on to Blondin's back and would let him walk out on the tightrope above the raging falls. There's a difference between belief and trust, isn't there? The people in the crowd had belief that Blondin could carry someone. But none of them trusted Blondin to carry them out on to the wire. I think that so many of us struggle with this when it comes to trusting God. We say that we believe God has our future in his hands. We say that we trust God not to let us fall. But when it comes time to step out on to the wire, we decide it's safer on the shoe. Belief is mostly just an idea--a feeling, a set of propositions, perhaps. Trust is when your belief is put to the test when you step out on to the wire and know that God is in control and won't let you fall. Trusting God is not a spectator sport. You can't stay on the shore and exercise trust. Trust requires that you do something to demonstrate it's not just an idea. The passage of Scripture that we are going to be studying today is one of the most foundational texts in my life--especially as it relates to trust. The passage we're studying is Psalm 40, and I've had a very long, and interesting relationship with this text. 30 years ago, I heard Psalm 40 proclaimed like I'd never heard it before and I never forgot it, despite all of the struggles I had with my faith, belief in God, the Bible... I was at a U2 concert in Tampa in the middle of stadium. U2 always closed their concerts out with a song entitled, "40." The lyrics came directly from Psalm 40. There are some scholars who have asserted that Psalm 40 is actually two different psalms mashed into one because of the way it changes. It goes from the singer reflecting on the way God rescued him in the past, to the singer calling for God to rescue him and restore him in the present before moving on to a call for God to keep rescuing him in the future. The psalmist looks backward at this point. "I was in the mud of the mire..." it translates literally, using the same kind of language that you find elsewhere in the Hebrew scriptures in the stories of Joseph, who is throne into a pit... and Jeremiah who is left to starve in a pit. In other words, things look pretty bleak. The psalmist starts looking upward at this point, so to speak. He declares in a play on words that many will "fear" or ra'a the Lord and will "trust" or yara the Lord. Fear and trust are synonymous in the Scripture. And when I say "fear," I mean the sure and certain knowledge that there is a God and you are not God--not by a long shot. Lots of people confuse the fear of the Lord with dread, guilt, shame and the like. But in the Hebrew mindset, it's something the fluctuates between sheer terror and sheer exhilaration. Let me explain. In the first book of C.S. Lewis' beloved Narnia series the lion Aslan--a not-so-subtle metaphor for Jesus himself--asks sisters Lucy and Susan to jump up on his back and hold on tight because he needs to run. As the great lion runs across Narnia at breakneck speed, the sisters hold on to him as tight as they can, terrified at the pace he is going, but feeling the warmth of his fur and his comforting strength. That's what the fear of the Lord is like--and the singer here indicates just how much it changes him, and helps him to trust. Continuing his upward gaze, the psalmist starts talking about the transformation that he's undergone by his own trust of God. He declares that because of the "ears you have dug for me" (literally translated) he is now able to hear and internalize what is most important in terms of God's desires. He doesn't have to worry about making sacrifices in the temple so much as he needs to give himself to the Lord. The scroll or the revealed written word of God, the torah or teachings of the Lord moves from something written on paper to ideals and values and truth that is now in his heart. And as a result of his trust in God's promises, and the transformation he's undergone, and the rescue he's experienced... the psalmist can't help but share it with the whole world. Finally, the psalmist looks forward in spite of all the conflict and obstacles in his way, he declares that his trust is in God and that he has confidence in the future based on God's character, God's hesed, or loving kindness, God's everlasting, motherly love. What I take away from this psalm more than anything else is that it doesn't matter what is happening--whether I am in times of crisis or peace--I am perpetually needy. I may be simultaneously being made new because of God's great love, but I am still perpetually in need of it. That is, in fact, what Psalm 40 declares to us: You never stop needing God. Ever. And even further, it teaches us that we need to be a faithful witness to God's great love and mercy with as much gusto and excitement as when we are going through times of adversity. It's so easy when things are great to say that we believe God can carry us across the raging water of uncertainty. But when we actually need to cross that river, and brave those falls... do we do the same, and with as much energy? Are you living by the Gospel you claim? Are you on the wire, letting Jesus carry you across? Trusting God that it's all good? Trusting God like this requires something of you. Trusting God isn't a spectator sport. In Psalm 40 we are exhorted to Trust God... to Offer ourselves... to Share the Good News of what happens when we trust God... These are not passive things, are they? You can't do these kinds of things from the shore--they all happen out on the wire over the water. Sometimes we need to have our minds blown to get this. Nearly 20 years ago, I had my mind blown and my course changed because I decided to step out on to the wire with God and simply trust him. My life was going awesome back then. I was a rising star in the history department at Florida State University. I had received the highest fellowship you could get as a grad student, and was on track to complete my PhD in Early Modern British History at either University of Chicago, University of Maryland or George Washington in Washington DC. My professor was a world-renowned expert on 17th century British History and he told me I was one of two students he'd had in his 40 year career who he felt like could step into his shoes and carry the work forward. My wife had just landed a great job at a large, nation-wide law firm and was finally making real money. Things were going great. Merideth and I had joined a small Presbyterian church in Tallahassee Florida. We were easily the youngest people in the church at the time. And we were marginal members at that point--we came to church on Sunday morning, but that was about it. It's just where we were at the time--we had a lot going on. For some reason, someone thought it was a good idea to nominate me to serve on the Christian Education committee. I had never been raised Presbyterian, so I didn't know about the whole committee thing. So I showed up at this meeting and there were only like four other people there, including the pastor. The entire focus of the meeting was on what they were going to do to hire a youth director. They had $8,000 total to pay the youth director, and have money for the program. And they only had that money for one year. After that, it was gone. I thought to myself, "These poor people--how the heck are they going to find someone stupid enough to work for that kind of money?" And all of a sudden, I felt as though someone was standing behind me with their hands on my shoulders. It was if I was the only person in the room. And the overwhelming feeling I had in that moment was: "This is what you are supposed to do... You are the person stupid enough to do this." I fought with God on this. I was comfortable in my spot on the shore. I didn't want to step out on to the wire, into the unknown. But the feeling wouldn't go away, and I couldn't shake what it felt like to have those hands on my shoulder. So I decided to trust God and step forward. I started working as a youth director at this tiny church with only six kids in my youth group. It didn't take long for me to realize that what God wanted for my life was going to take even more trust. I let go of the dreams I had dreamed for myself--in order to take hold of the dreams God had been dreaming for me all along. That one act of trust, to step forward when it didn't make sense, changed everything. It's moments like that--and there have been a lot of them in my life--that cause me to look backward and see where God has been working in my life. And that causes me to look upward in thanksgiving and praise for what God is doing. Which then leads me to look forward and trust God, no matter what is ahead of me. You may not feel the hands of God on your shoulders. But maybe you're here today and you are starting to understand what it means to experience the fear of the Lord, like I did. Maybe you are struggling with God's will for your life, you know you are being called to do something but you are afraid, you want to stay on the shore where it's comfortable. I have had my share of moments when I was tempted to stay on the shore and never step out on the wire---but man the view from the wire is so much better... Come on! If you want to step in the right direction this year (and we know that it's your direction not your intentions that determine your destination) you're going to have to trust God. And trusting God is not a spectator sport. Step out. Trust him. He's got you.